On the occasion of the World Water Day, established by the United Nations in 1992 for March 22nd, InSinkErator raises people’s awareness about the sustainable behavior at home by presenting a vademecum against the water waste. Cultivating and producing food requires large amounts of water, so wasting it produces a chain reaction that people are not always aware of. One hundred buckets of water are needed to make a loaf of bread, 54 buckets are needed so that a chicken breast arrives on the table and 6 buckets of water are necessary to grow a potato. 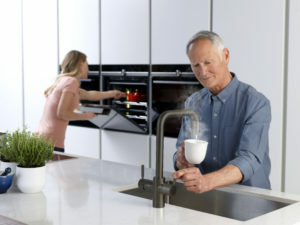 In this context, the domestic use is one of the main causes of water waste and this is why InSinkErator, which this year celebrates 80 years, is carrying out a research to offer increasingly eco-sustainable products. Among the main tips there is to avoid leaving the tap open while waiting for the water to reach the desired temperature. In this case, a technologically advanced tap such as 4N1 Touch by InSinkErator can be a solution as it instantly offers water between 88° and 98°C.